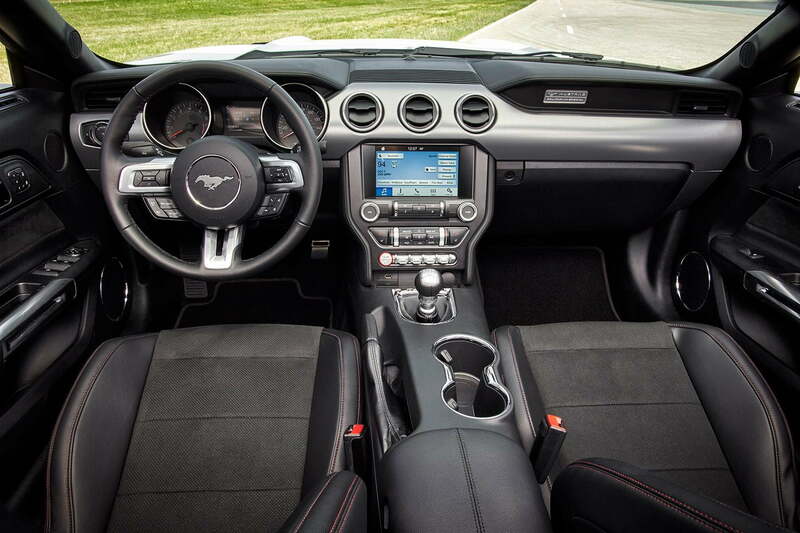 Last year, Ford celebrated the 50th anniversary of its legendary “Pony Car” with the 2015 Mustang, a thoroughly reworked and reimagined model the company hopes will keep this ‘60s icon relevant well into the 21st century. Greatness always attracts imitation, though. The original 1964 ½ Mustang created any entire “pony car” segment, which is still going strong today. It took Chevrolet about two years to answer Ford with the first-generation 1967 Camaro, but its rival to the redesigned 2016 Mustang arrived much more quickly. Like its Ford foe, the 2016 Camaro aims for poise and efficiency as well as muscle. So which will it be, 2016 Chevrolet Camaro, or 2016 Ford Mustang? 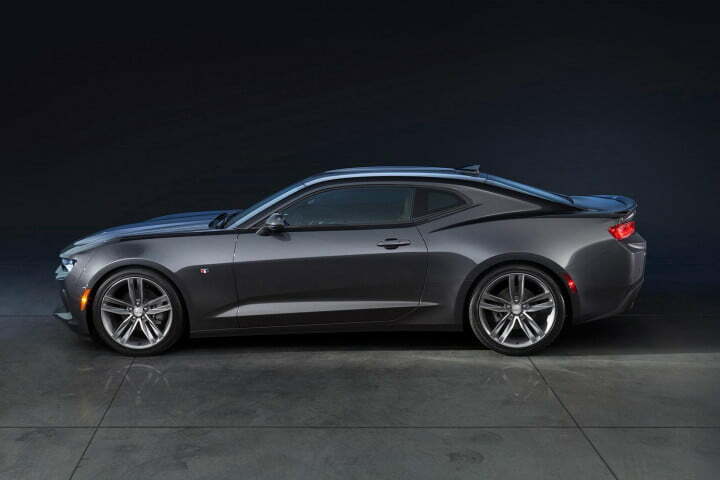 While both cars feature retro elements that nod to their long histories, the exterior designs of the Camaro and Mustang are both thoroughly modern. The Mustang pulls an aesthetic J-turn from the previous generation, which slavishly copied the classic 1967-70 models. 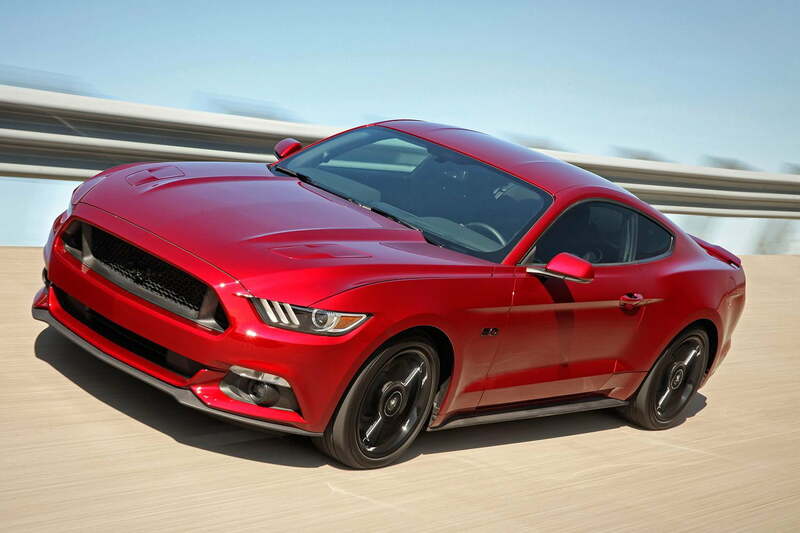 The 2016 model retains some signature Mustang cues like the grille, cab-rearward proportions, and segmented taillights with sequential turn signals, but everything is slickly sculpted. That helps slim down what is actually a pretty large car, and provides better aerodynamics according to Ford. It also makes the Mustang more than just a pop culture reference. 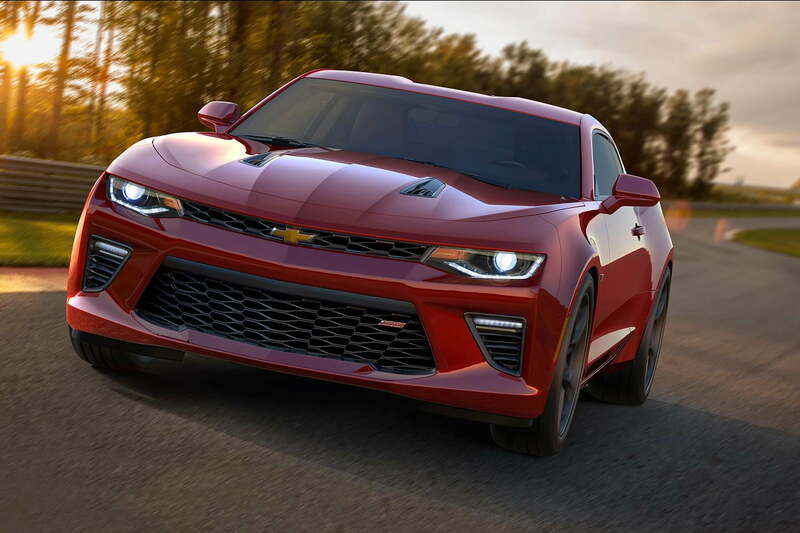 At first glance, such a dramatic change looks much more significant than the relatively subtle changes Chevy made for the 2016 Camaro, but Ford was really playing catch up to the General Motors brand in a way. When the Camaro was relaunched as a 2010 model, Chevy went with a more modern design than what Ford offered at the time. If nothing else, the 2016 Camaro proves the saying “if it ain’t broke, don’t fix it,” but Chevy also runs the risk of its new model not appearing new enough. American manufacturers often get bashed for low-quality interiors, so the 2016 Camaro and Mustang have as much to prove here as they do in the more fun realm of performance. Ford’s strategy was to bump up material quality while adding a few whimsical touches. The speedometer reads “ground speed,” and there are rocker switches on the center console that make you feel like a fighter pilot. Chevy went in the opposite direction. 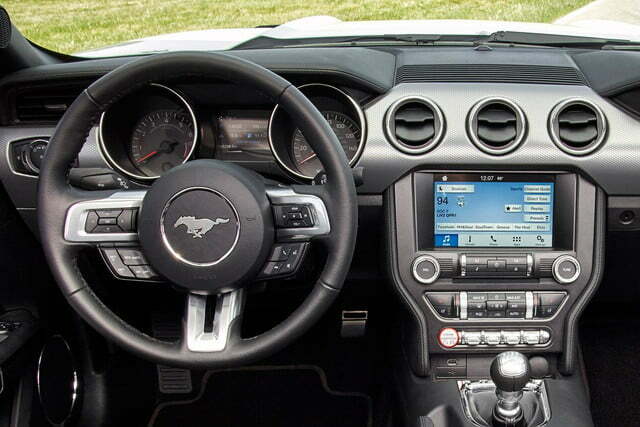 Sure, the Camaro’s traditional “twin binnacle” gauge cluster remains, but you can stuff it with an available 8-inch display screen. Another 8-inch screen can be specified for the center stack to handle infotainment functions. So which one is better? The Ford’s aeronautical theme looks cool now, but only time will tell if it stays that way, or just starts to feel cheesy. 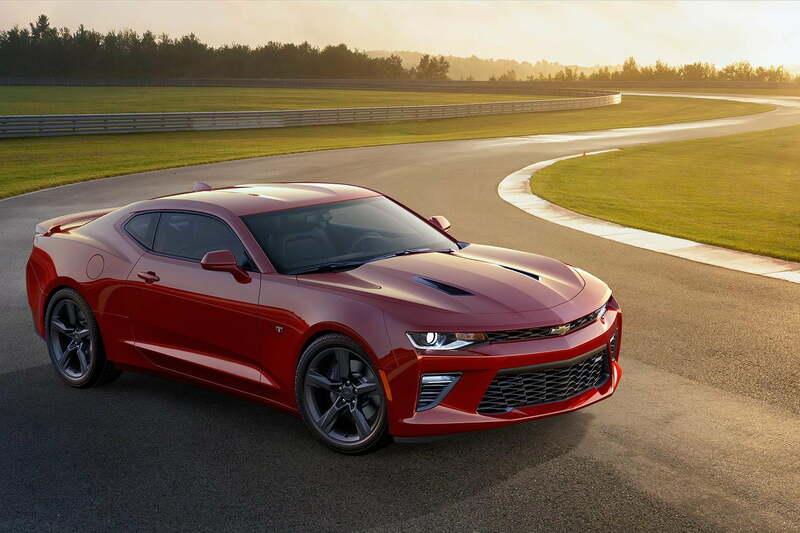 The Camaro may have gone too far down the tech route; the interior may seem less impressive on base models that don’t have the fancy screens, and the lack of mechanical parking brake takes away some of the fun of a rear-wheel drive sports car. The Camaro vs. Mustang rivalry really comes into focus under the hood. Ford 2016, powertrain lineups mirror each other, with both carmakers offering naturally-aspirated V6 and V8 and turbocharged four-cylinder engines. Ford kicked off the four-cylinder trend with its 2.3-liter EcoBoost engine, which produces 310 horsepower and 320 pound-feet of torque. 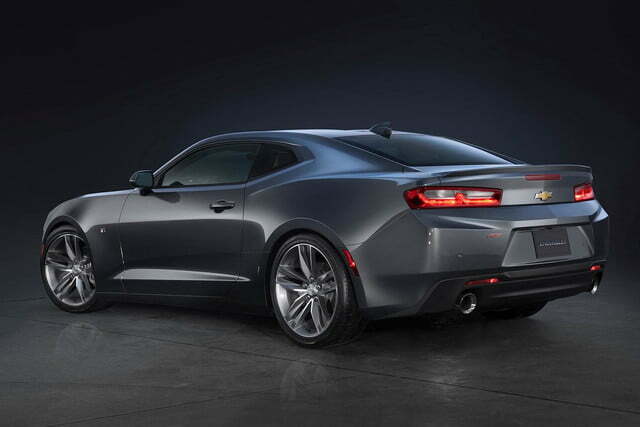 Its Chevy counterpart is a 2.0-liter unit with 275 hp and 295 lb-ft. 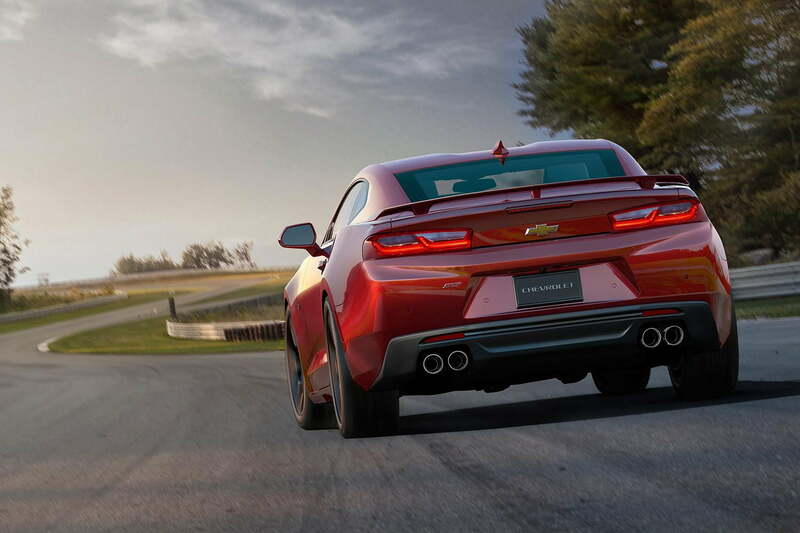 Adding a pair of cylinders, the 2016 Camaro gets an updated version of the previous car’s 3.6-liter V6, good for 335 hp and 284 lb-ft. The Mustang also continues with a holdover from its previous generation, a 3.7-liter V6 that produces 300 hp and 280 lb-ft.
It’s worth noting that Chevy will make its four-cylinder engine standard on the Camaro, while the cheapest Mustangs ship with Ford’s V6. 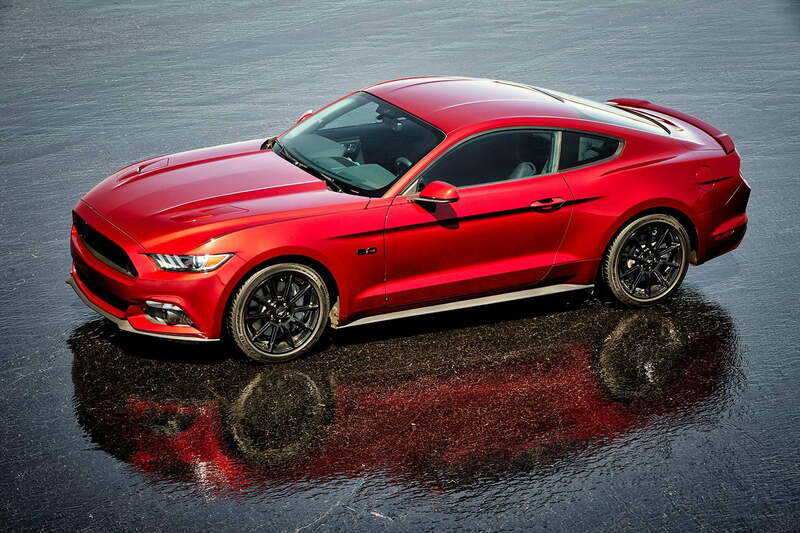 Of course, muscle cars like the Camaro and Mustang are all about big, loud V8s, and the 2016 models don’t disappoint. 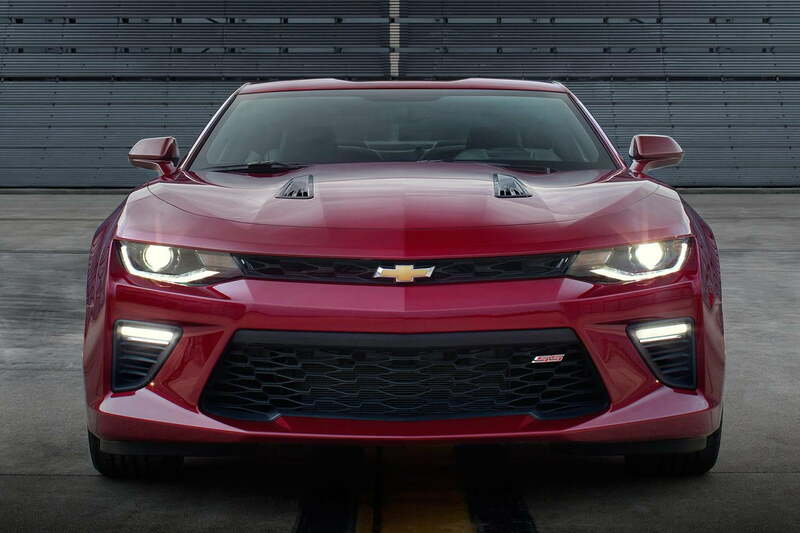 The Camaro SS packs the 6.2-liter LT1 V8 from the Corvette Stingray, with the same 455 hp it produces in the ‘Vette, and 455 lb-ft of torque. The Mustang GT continues with the 5.0-liter “Coyote” V8 introduced back in 2011, and now producing 435 hp and 400 lb-ft of torque. Given that the Camaro’s Corvette-sourced V8 outguns the Mustang’s, and that the Ford’s V6 is basically a placeholder for rental cars, this round goes to the Bowtie Brigade. Without any hard performance figures to go buy, it’s hard to say whether the 2016 Camaro or 2016 Mustang is the most capable car. Still, the changes made by Chevy and Ford in their most recent updates make both more well-rounded than ever before. 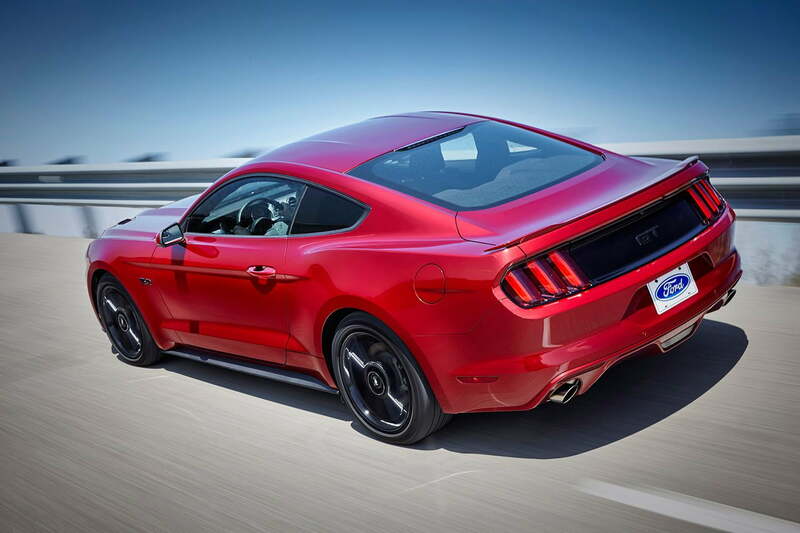 Rear suspension isn’t normally the stuff of headlines, but when Ford announced that it was replacing the Mustang’s solid rear axle with an independent setup, it got plenty of attention. The move may have angered some old timers, but it helped make the Mustang into a proper sports car as well as a muscle car. 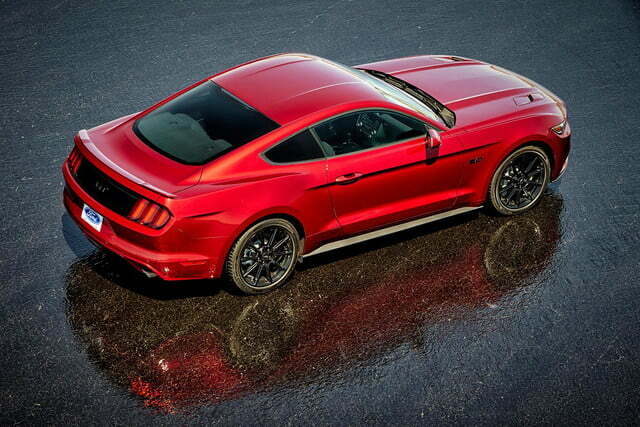 Ford also offers a number of notable performance options for on-track driving. 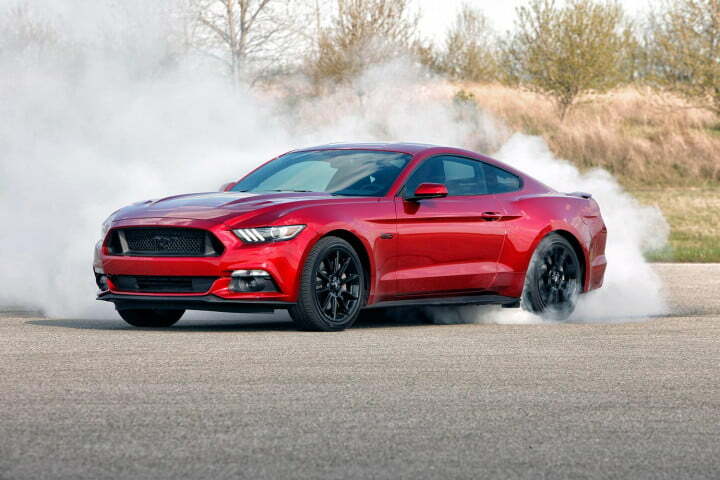 There’s a line-lock feature on the Mustang GT that locks the front brakes for easy burnouts at the drag strip, and performance packages for the GT and EcoBoost with beefed-up components for the road course. For 2016, Ford will also introduce new high-performance Mustang variants. The Shelby GT350 and GT350R honor their legendary namesake by taking aim at Europe’s best sports cars, as well as Chevy’s Corvette. Meanwhile, the lightened and downsized Camaro should be pretty sprightly in the bends. Its hardware cupboard isn’t bare either, thanks to available Brembo brakes and magnetic dampers for the SS model. 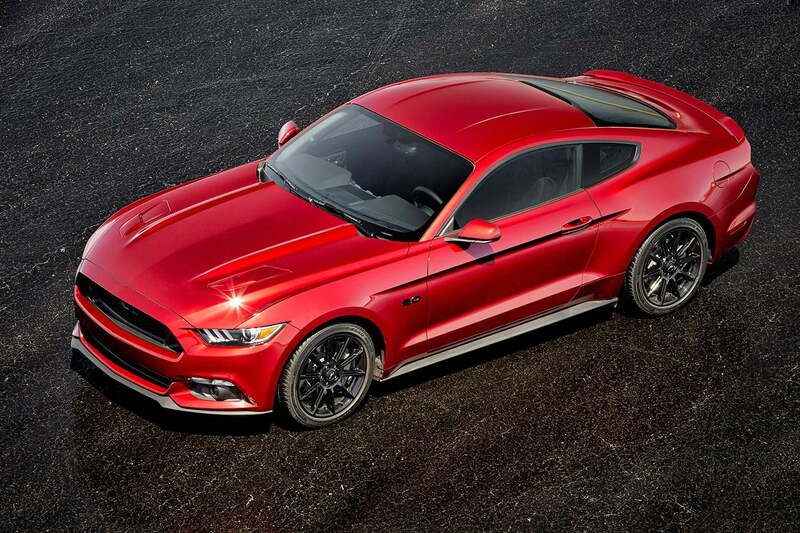 Ford only offers the latter feature on its limited-production Shelby models. Chevy will probably grow the list of available Camaro performance options and models, but for the now the Mustang still looks more impressive. Pricing information for the 2016 Camaro won’t be available until the car goes on sale this fall, but the new model should stay pretty close to the current car, which in turn virtually mirrors the Mustang. A base Mustang with the 3.7-liter V6 starts at $24,625, including destination. The turbocharged EcoBoost four-cylinder starts at $26,125, and the V8 Mustang GT starts at $33,125. If Chevy continues the pricing strategy it employed with the 2015 Camaro, then the new model should also fall within that roughly $24,000-$33,000 range. Of course, base price for the 2016 Camaro will buy a turbo four-cylinder engine, rather than a V6 as with the Ford. It’s too early to declare a leader here, but the prospect of relatively affordable performance cars should be considered a win for consumers. The Camaro and Mustang are two of the coolest cars around, period. Their names are recognizable even to people who don’t really care about cars, and over the past few decades they’ve assembled legions of rabidly loyal followers. Diehard fans will always hold their chosen favorites above all else, and it’s admittedly hard to choose between two cars that exude so much coolness. But in the end, it has to be the Mustang. It came first, and made such a splash that GM had to build the Camaro as a reaction. Plus, Steve McQueen didn’t drive a Camaro in Bullitt.